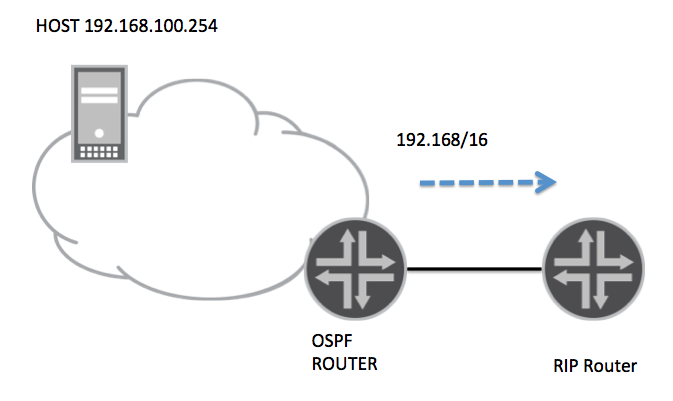 Let's say you have an ospf network and you are connecting to a RIP router. You want to advertise your network to the RIP router, but do not want to advertise all your routes in order to keep the amount of prefixes low in the RIP routing table. You can create an aggregate route, but you want to only advertise this route on the condition that a host route is available in OSPF. First the setup. We've got a network subnet of 192.168/16. We then want to connect to the RIP router. Notice that we're going to only advertise if the 192.168.100.254 host route appears in the routing table. So now we'll use the "generate" route instead of an aggregate route, but also add a policy. Now let's check if the policy works. As you can see the contributing route is available, so we can now advertise this aggregate to the RIP router. Let's check to see if we're advertising the route. Now if we stop receiving the host OSPF route.